Below is a story on how a simple trip to the grocery store can turn into ground for racial inequality. Watch as author and educator Joy DeGruy explains the difference in treatment from a grocery store clerk between herself and her lighter-skinned sister-in-law. It’s a simple story on the complicated space Blacks navigate in the US in regards to race. There’s also a twist on the role Whites can play to stopping racial inequality. The video got me to think how other privileges people can stop inequality whether its men, the middle-class, straight people, Americans… well the list can go on. Some few days to the day King gave his speech, a great time for a post like this. Our generation will keep fighting this with all our arsenals. 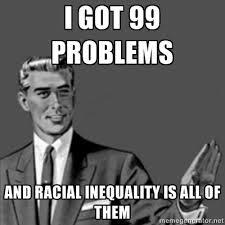 Having been born in a predominantly black country, i can only understand racism based on what i read or see in the media. Efo, you are SO right. The Dark skin vs. Light skin “battle” is still so thick. You would think that there are two gangs going against each other. It’s sad the damage we do to ourselves. The documentary Dark Girls talks a lot about this. Thanks for your commentary, Efo.